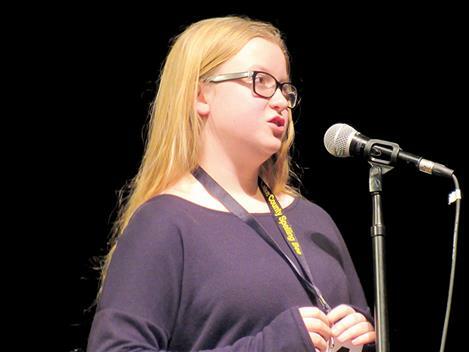 Grace Elverud correctly spells "grinch" during a 10-round battle with Elizabeth Cunningham for second place. 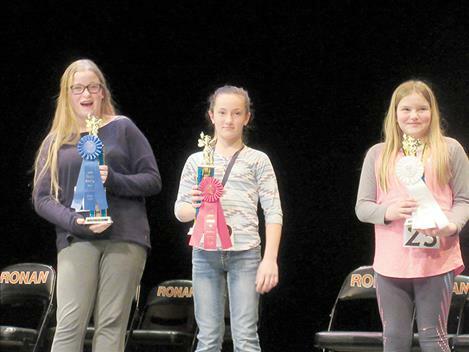 Michelle Jury, Grace Elverud and Elizabeth Cunningham, from left, pose with their spelling bee trophies. 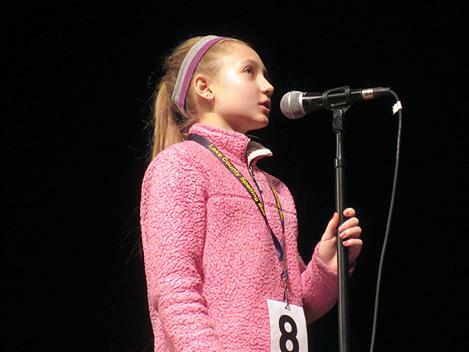 St. Ignatius sixth grader Lola Schock battles in the spelling bee as the tension increases. 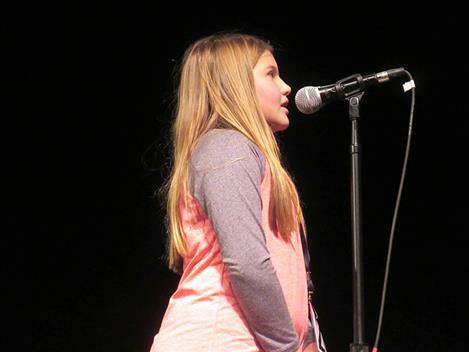 In the end, St. Ignatius eighth grader Michelle Jury took first place in the annual event. 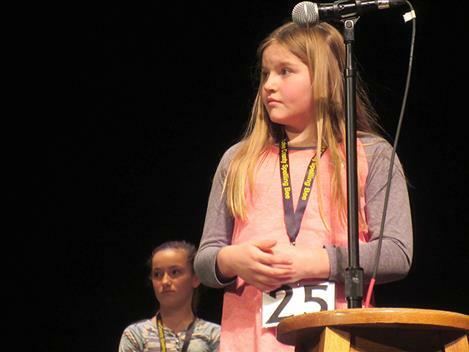 Charlo fifth grader Grace Elverud came in second, and Elizabeth Cunningham, a sixth grader from Polson, was awarded third place. 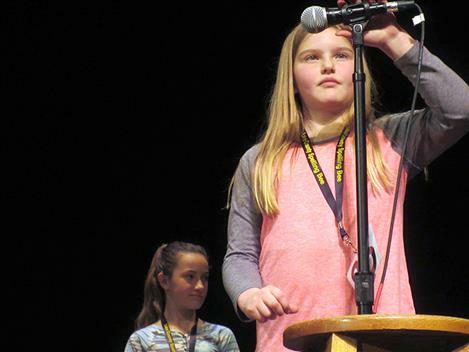 Students cycled to the microphone under bright stage lights, twisting their hands and gazing up to the ceiling with focus as an audience of about 120 watched. 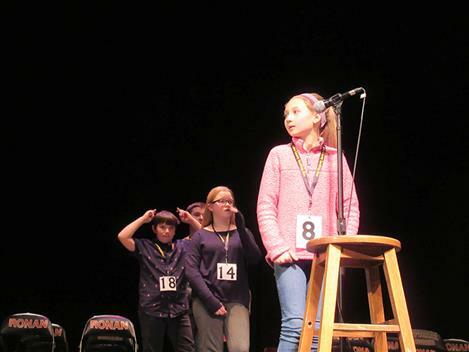 The participants earned their spots in the county bee by placing in spelling competitions at their respective schools. 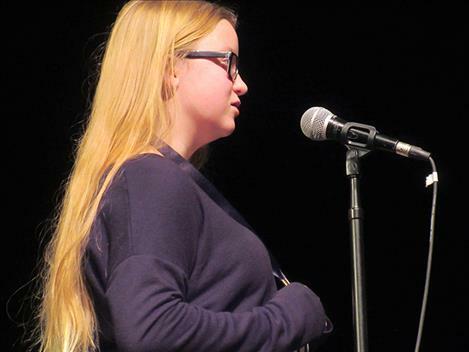 After a practice round to work out the jitters, the pronouncer began to present the words that students needed to spell in order to advance to the next round. The difficulty of the words the students were asked to spell increased with each round. 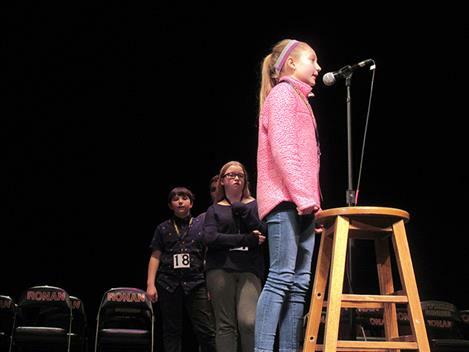 In the third round Ronan sixth-grader Alorah Barker was the only speller to say the correct spelling of her word, which was “anchovy,” however, in order to win the bee, a speller has to spell an extra championship word correctly. 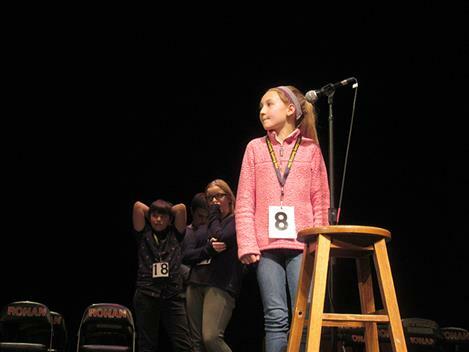 Barker failed to spell her championship word so all of round three’s participants returned to the stage. The same thing happened in round seven, when Jury, who would go on to win the competition, was the only speller to correctly spell her word. 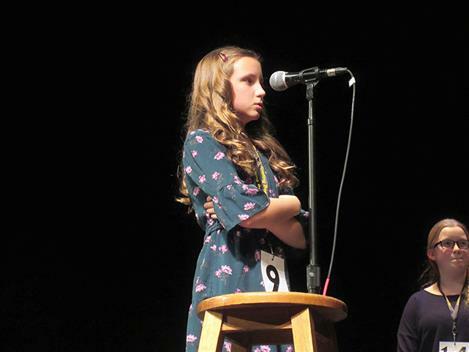 She misspelled her championship word, “geisha.” As a result, all the spellers who had made it to round seven returned to the contest for round nine. 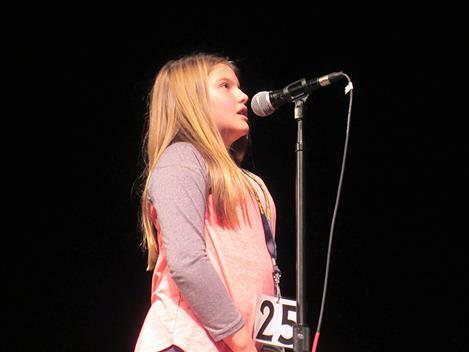 Jury proved her skill as a speller again in round nine when she was the only contestant to spell her word. 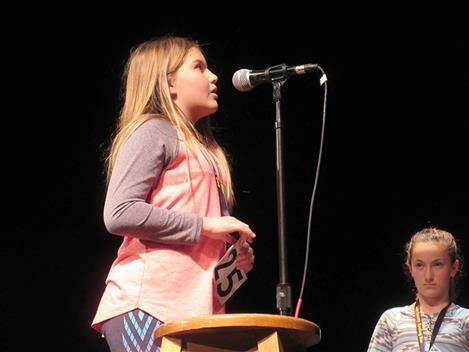 She stepped up to the microphone and correctly spelled “cynical,” then spelled her championship word, “lieutenant,” to secure first place. “I had seen that word a while ago and it stuck in the back of my head,” she said. The fight for second place was not as easily won. Only two spellers remained by round 12. Cunningham, who would go on to place third competed with Elverud for the second place ribbon. The two were evenly matched for 10 rounds until round 22 when Cunningham spelled “chorus” incorrectly and Elverud correctly recited the spelling of “hindered.” Elverud also spelled her championship word, “grinch,” correctly, winning second place. “That was really one of those nail-biters,” Lake County Superintendent Carolyn Hall said of the drawn-out competition for second place. 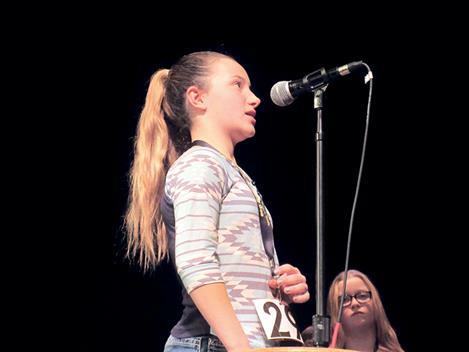 Elverud, the second place winner, said she excels at spelling tests at school but didn’t know how she would match up against other skilled spellers from across the area. 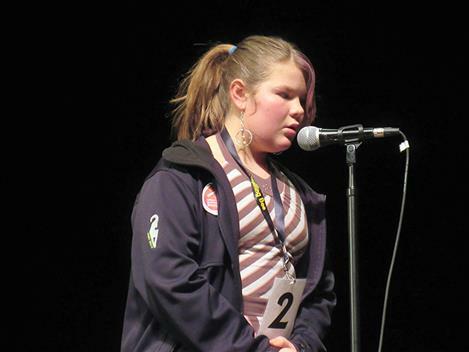 Elverud won’t be able to attend the state spelling bee, so she gave her place in the competition to third place winner. 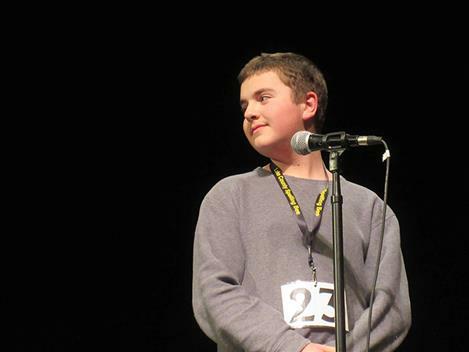 Elverud has a prior commitment on the day of the state spelling bee to showcase another talent, which is raising cows. 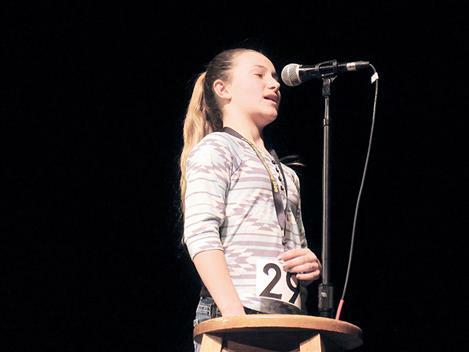 Cunningham, who earned third place, said she nearly won a spelling bee a few years ago at her school in Polson. 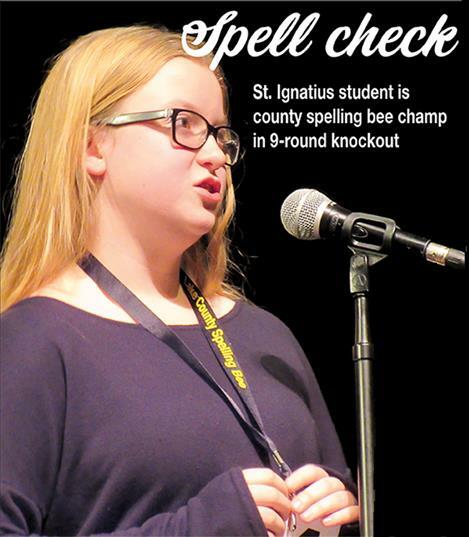 The experience inspired her to pursue a spot in the county spelling bee. She and a friend practiced for the bee every day for a few weeks leading up to the event. According to Cunningham, her confidence built as the event went on. “After about eight rounds I got used to being up at the microphone,” she said. 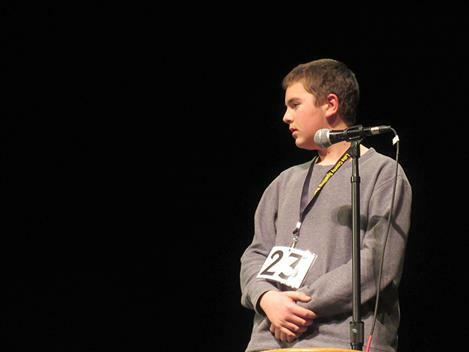 Jury and Cunningham will attend the Treasure State Spelling Bee at Rocky Mountain College in Billings on March 16. 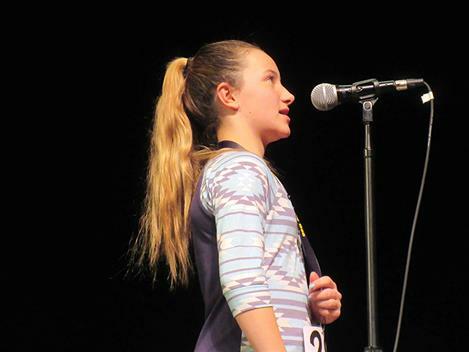 The winners of the state spelling bee will go on to compete in the Scripps National Spelling Bee, which will be held in Maryland this May. The Lower Flathead Valley Community foundation donated money to cover travel expenses for the winners who will attend the state bee. 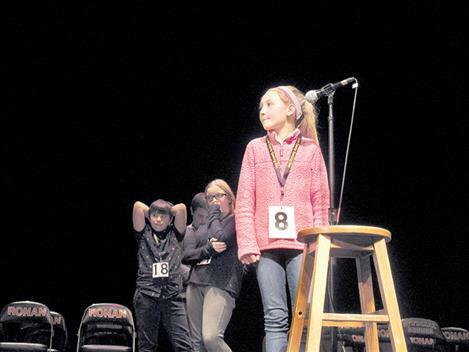 Lake County Superintendent Carolyn Hall said the spelling bee is an established annual event, however, in an era of spellcheck, memorizing spelling is less necessary than it once was. The county has debated whether the event is still relevant. Hall said the education department decided that even with the support of technology spelling is an important skill.